Columbus Monthly is a relevant, influential resource for Central Ohio’s most engaged readers. Each month the magazine presents an informative and entertaining digest of the most compelling topics, people, events and ideas in the city, from news, sports and politics to style, dining and culture. This is the magazine that’s as smart as the city you call home. No other monthly publication reaches the Central Ohio market quite like Columbus Monthly. Columbus Monthly’s circulation strategy delivers to the most affluent, educated households in the market. The beautifully designed and award-winning magazine helps readers understand and navigate our ever-changing metro area better than any other publication. The audited readership is 100 percent verified by Circulation Verification Council, an independent, third-party auditor. 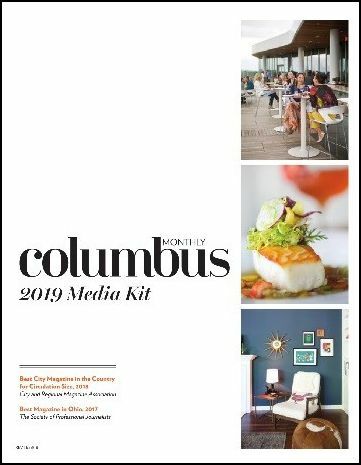 Columbus Monthly also benefits from its affiliation with the City & Regional Magazine Association—the only local publication that is a member of the national organization. Our paid readership means that Columbus Monthly subscribers are active and intentional. They read, engage and keep the magazine every month. In fact, 81% of subscribers hold on to Columbus Monthly for one month or longer—that’s coffee table status. And they spend more than 40 minutes with the publication each month—this means that a single advertising message will most likely be viewed more than once. Columbus Monthly readers are affluent, educated professionals who care about their community and enjoy the finer things in life. Columbus Monthly readers have the interest and income to take advantage of all that Columbus has to offer. No other local publication reaches the concentration of upscale readers that Columbus Monthly delivers. 72% of Columbus Monthly subscribers frequently purchase products or services from ads seen in the magazine. Published monthly since 1975 (more than 500 issues under our belt), our consistency has yielded a loyal, paid audience. Target Audience: Affluent Adults, Adults with Children, Baby Boomers.